Introducing TOP 20 of the largest world banks by the date: January 13 2019. The rating of the biggest banks is built according to banks’ total assets. Read more about this index at the end of the article. Different banks of China have taken this rating top for several years in a row. It is quite logical, taking into consideration the annual economy and industrial surplus of the Heavenly Empire. Moreover, pay attention to China Banks logos. One copies another; we don't even know what this is all about. Industrial and commercial Bank of China (ICBC) – is the largest and richest bank in the world. It has $4 009 billion total assets according to the latest data, and its market capitalization totals $238 billion. The Bank was founded in 1984 and now has more than 460.000 employees. Its headquarter is located in Peking. More than 70% of the corporation is the government's property. The Second in this rating and second by “size” bank of china founded in 1954 and now called “China Construction Bank”. According to the latest data, it obtains $3 400 billion assets and its market capitalization totals more than $200 billion. Originally, CCB was created for government exchanges, and only later, it was redeveloped into the commercial one. The company includes more than 14 thousand departments all around the globe where 372.000 employees work. ABoC was founded in 1951 by Mao Zedong to help collective farms, peasants and workers. Currently, this bank entrenched inside fiscal and commercial corporations of China and the whole world. The headquarter is also located in Peking, and has near 24.000 representatives in the country and abroad. Total assets of Agricultural Bank of China collects more than $3 235 billion and its market capitalization makes $190 bln. according to the latest data. Bank of China is one of the oldest and most reliable banks in China. It was created in 1912 and still leads the inside banking sector. More than 70% of the company belongs to China Government, and it has offices in more than 20 countries abroad. According the data, its assets collect near $2 991 billion and its market capitalization makes $162 bln. This Japan holding company has $2,7 tln. assets what makes it one of the “best" banks in Japan. Developed department network all around the world allows MUFG to perform in 40 different countries. The company was created in 2005 on the merge of two largest banks of Japan, and its headquarter is located in Osaka City. JPMorgan Chase is one of the most emerging and popular US bank in the financial sector. This company was founded in 2000 as a result of merging several huge banks. JPMorgan Chase HQ is located in New York City, Manhattan. It is one of the largest investment companies in the world. Now its assets total $2 533 bln. and its market capitalization is over $332,24 bln., which also makes it one of the most expensive companies in the world. London HSBC is one the biggest banks in Europe, totaling $2,5 tln. in its assets. Originally, the purpose of its creation was to perform exchanges between Europe and China, and it still stays crucial in such actions. It also has more than 10 subsidiaries which perform all possible operations inside this sector. BNP Paribas was founded in 1999, and now it tops the fiscal, banking and insurance ratings. Currently, the company has representatives all around the globe and its headquarters are located in Geneva, Paris and London. Its assets compounds $2 357 bln and $73 bln. of market capitalization. BoA is the second biggest bank of USA, which has an extensive range of fiscal services in the whole country and abroad. The headquarter is located in Charlotte City, North Carolina. According to the latest data, BoA balance has $2 281 bln. assets and its market capitalization sustains $163 bln. 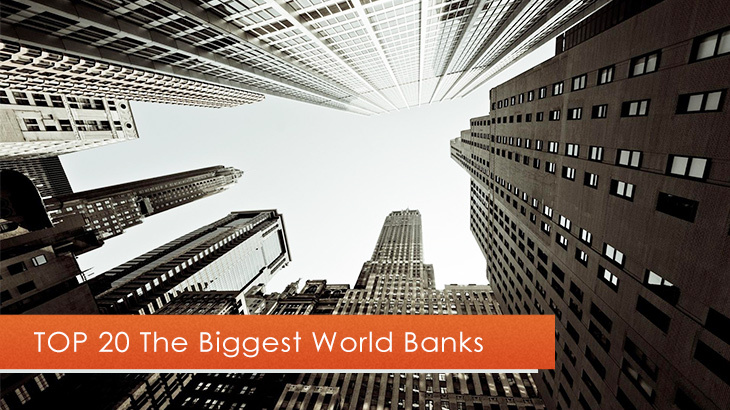 French bank Crédit Agricole ends the list of TOP 10 of the biggest world banks. It has a balance of $2 117 bln. in assets. Crédit Agricole is one of the largest companies in France, which successfully controls a large part of the banking sector inside the country. Banks which can at any time break in to the rating of top 10 largest banks. 11 Wells Fargo USA $1951 bln. 12 Japan Post Bankм Japan $1874 bln. 13 Citigroup USA $1842 bln. 14 Sumitomo Mitsui Financial Group Japan $1775 bln. 15 Deutsche Bank Germany $1765 bln. 16 Banko Santander Spain $1736 bln. 17 Mizuho Financial Group Japan $1715 bln. 18 Barclays Plc England $1532 bln. 19 Societe Generale France $1531 bln. 20 Groupe BPCE France $1512 bln. *Some data can be inaccurate, in respect of absence or limited access to reports issue during last periods. The list of countries by total number of banks in the “top 100 by total assets". What are the criteria based rating? Annually, rating agencies, analysts and fiscal companies compound ratings of the most reliable, profitable and successful global bank corporations. However, filtration settings are quite specific to find the largest world bank. That is why ratings are made by different parameters because the same bank can lead by one criteria and be out by another at the same time. Total assets sum is the total value of all fiscal units regarding company’s property, as well as financial capital which consists of own corporation resources, investor assets, interbank credits and assets received from bond issues. Such rating is built according to the total assets sum of a bank, as it was told before. Market Capitalization is the cumulative value of a company with regard to its all substructures and commercial assets. Corporate market capitalization is calculated in regard with the exchange value of its shares. Moreover, very important banking gauges are: operational and clear profits, total turnover, and the number of its departments and employees.